Natural light pours in through the side french-glass windows of the chapel and enhance the cozy warmth of the paneled walls. The hand-crafted wooden benches are polished to a brilliant natural finish, and they are both comfortable and unobtrusive whether you have six or sixty guests. The candelabra provides an elegant and charming atmosphere for your wedding. A chandelier adds the finishing touch and compliments the setting. 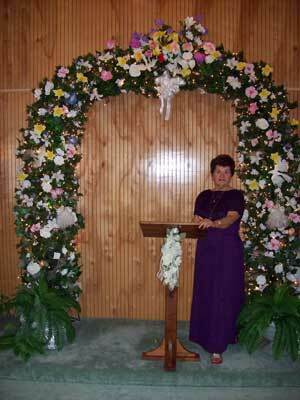 Within the chapel is a beautiful 8-foot arch decorated in evergreen and accented with flowers and doves. The arch comes alive with over 1500 tiny lights, and it and other decor in the chapel can be altered to reflect the season in which your marriage is held. At Christmas, Janice often decorates the arch with poinsettias. You may also request a special theme that may be particularly important to you and your groom. The Isle of Wight Wedding Chapel servers all of Hampton Roads. 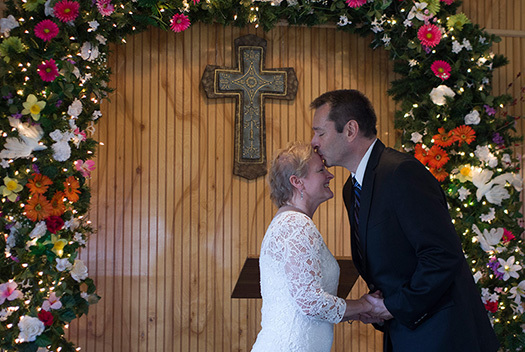 We get many guests from Virginia Beach, so wherever you are, come get married at the chapel!